This EKG comes courtesy of Dr. Litvak. An 83 year old female with a history of COPD and CAD presents to the ED with a brief episode of right sided CP associated with palpitations. Patient denies syncope. No nausea, vomiting. No SOB. Vital signs: Pulse – 80, R – 18, BP - 144/92, O2 sat 98%. Non-conducted PAC’s are treated the same as patients with PAC’s – look for a cause, check electrolytes, usually no emergent intervention needed. The EKG demonstrates a sinus rhythm at a rate of approximately 80. After beats #4, 7 and 11, there are P waves with no QRS complex following them (See below). However this is NOT 2nd degree AV block. If you map out the P waves, the “dropped” P waves come earlier than expected. In fact, they come right after the preceding T wave. Since the P waves come so early, the ventricles are still refractory so they do not conduct. The way we know this is not AV block is because the P waves come earlier than expected. This patient needs no emergent intervention and should not have a pacemaker placed. Non-conducted PAC’s may appear like a 2o AV block. You see P waves with no QRS complex following them and a pause on the rhythm strip. However, to call something 2o AV block, the P waves must come on time (i.e. the P-P interval must be regular). 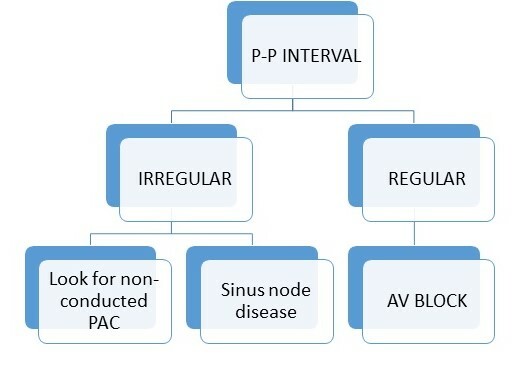 So, whenever you diagnose AV block, measure the P-P intervals and make sure they are regular. If the “dropped” P wave comes early, it is likely a non-conducted PAC and not AV block.